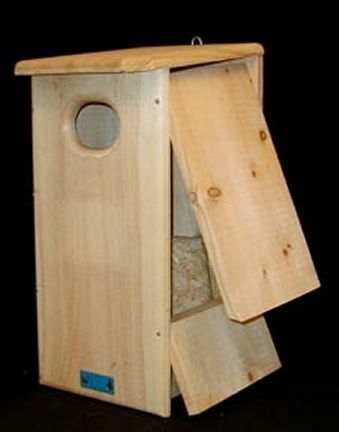 This house provides a perfect nest box for mergansers that normally nest in tree cavities. Positioning a house on a pole in the open water provides extra protection from predators. RANGE: Breeds across Canada from eastern Alaska, Manitoba and Newfoundland south in mountains to California, northern New Mexico, Great Lakes and northern New England. Winters south to northern Mexico and Georgia; also in Eurasia. HABITAT: Breeds on wooded rivers and ponds; winters mainly on lakes and rivers, occasionally on salt water. Hole Size: 4 in. x 5 in.